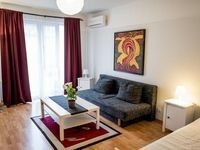 The Agape Aparthotel enjoys a central location in Budapest, only 200 m from the Blaha Lujza Tér metro station. It offers free Wi-Fi access. You can park your car in the underground garage on site. The reception is open 24 hours. 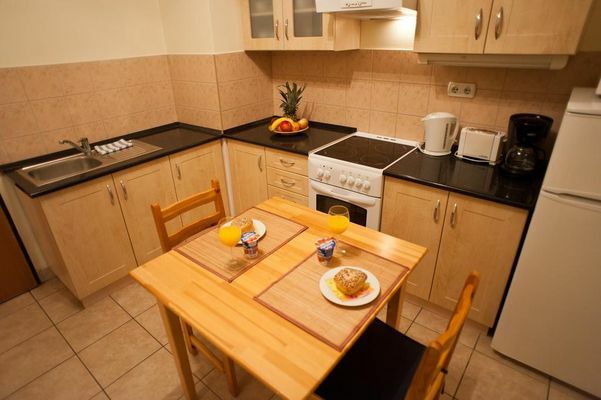 All apartments feature fully equipped kitchens and a satellite TV. Towels are changed every 3rd day, while fresh bed linen is provided every 6th day. Hairdryers and irons are available for free at the front desk. Initial and final cleaning is included in the price. Cots and high chairs available on request. Breakfast is available at the property. Many restaurants and shops, as well as the Jewish Museum can be found in the immediate vicinity of the Agape Aparthotel. The Hungexpo Fair Center and the Papp Laszlo Sport Arena can also be easily reached. Upon availability, the property can also provide a free Internet hotspot, in exchange for a refundable security deposit.